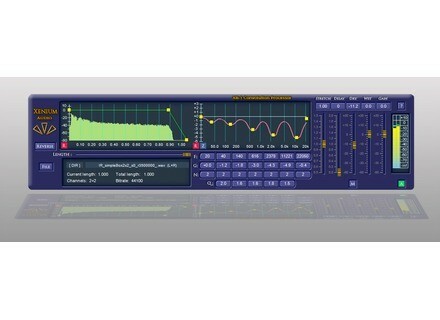 XR-1, Software algorithmic reverb from Xenium Audio. XR-1 is a 32-bit Windows (XP/Win-7) VST convolution plugin for high quality reverberation. It offers zero-latency processing with low CPU-consumption and non-destructive audio processing of impulse responses. Application is launched as VST-plugin XR-1, at any VST host. Mono, Stereo and True Stereo support. Easy of use and operation. (.WAV) - can be used any IRs. (.IRH) - special format to adjust separately amplitude and time position for 1,2,3 and tail reflection. Separate dry/wet control (-40db .. +20dB). High quality, linear-phase 7-band EQ (-30db .. +30dB) with 2 scales, separate adjustment of filter order and Q-factor. Low CPU-load even with small sound-device buffers. Xenium Audio has released IR library Part 2 for the XR-1 convolution processor.